The blues of the world is different , blue sea with blu sky . The reds of the world is different so. A charity working in public relations differences by working in public relations is a commercial organization or office, in that in addition to the expertise necessary for human relationships, love, kindness and patience is needed. As the name implies this unit, and the unit in charity Speaking of communication, such as a building that has a lot of windows and windows facing the horizontal direction is clear; efforts to promote center and goals in different areas to communicate with other government agencies and non-governmental organizations. Of celebration and entertainment programs for children and Institutes affiliated to participation and cultural programs, etc. Like any charity, the Hamdam charity rehabilitation (Fatah al-Mobin) together, to achieve its objectives in the field of supervision and empowering and supporting and assisting mentally retarded girls the subjects covered tries to communicate with and attract the cooperation and participation of individuals, organizations, enterprises, institutions, training centers and research and the sharing of experiences and information, with an invitation to cooperate and use of knowledge and experience another promote the activities of the Institute and also to promote cooperation and understanding to the most qualified way within the framework of the values and goals that introduced major Institute, providing short and long-term needs and plans, as well as the attention and support is good, step. Of years away from the inception of the Institute (1361) Public relations activities are just incoherent and many people have served in this unit. As recently as a public relations positions recognized the importance and impact of its work and its management of an institution is undeniable. Experience a range of relations, including public relations, it is by God's grace Hamdam institution in the field of love and companionship of people including artists, intellectuals and ... more or less important. We hope that it will be more beneficial to partner girls by planning better . I am Ali Reza Sepahie Laeen : 46 years old.I have 403 doughters.My three girls have birth certificate and 400 are to Hamdam children . These are my other assets, of sorrow and hope and good people around me. My main job was journalist from 68 until today. In newspapers and magazines and radio - television of a long written. I have read Stranded French translation of Ferdowsi University. And more than anything, poetry, and he was satisfied with the result of several books. I have also edited several publications. While the Cultural-Artistic Director of Ferdowsi University of Mashhad Municipality's Center for've been for a while. And now I have the most honorable work of my life and the head of the Public Relations Institute . What year and in what form did you join this collection? Early July 2015, That is now about two years, looking for something worthy that I had and I heard a fellow companion wants ... a friend and a member of the board of directors of the institution, and this was also due to the connection that was my present to friends and colleagues. What is the scope of the work and activities of your institution? You know that public relations head of each department is the first point of interaction and communication and connections ... My colleagues and I serve ads and manage the Institute and the recommendations of donors and the board of trustees, constantly performing various work areas of our mission, scheduled festivals, and offer design and implementation of various ceremonies, welcoming and assisting visitors, advertising field presence in cyberspace, design and publish catalogs and posters relationship with the media and publishing news and reports of Institute, and commemorate events and a total draw, more attention to a companion, and facilitate the participation and support of more the people and donors of the Institute. Here are all the moments and memories is uncomplimentary to say. If I write or say the quarterly fills. Axis memories all feel satisfaction that I'm doing anything here, "I said again and again I say," I have a good sense of I work in companion. What hidden from some friends - graciously, of course - say you are better places in this institution and should be confined and limited ... I smile and say: After nearly 30 years of work in Mashhad, companion noted with satisfaction the only place where I work and I'm sure all my income, to serve the people, it is people who are most worthy and necessary to serve . My last letter is the first letter of all human conventions, myself and my colleagues and clients, ranging donors and assistance and companion would recommend wisdom and benevolence and humility, and generosity to right. I am in honor of fellow at the Hamdam Institute from January 2015 and I work in the center is full of kindness the grace of god I know. Every day I thank God for sake of this endless grace he entered the institute, that I was honored to serve on the Hamdam Institute. While about 12 years working in the field of cultural and artistic experience to serve but to say that being in a totally unique experience for me is the Hamdam of beauty is different. One of the constant concerns of my mind, improvement and promotion of art and culture that this stretch is the root within me. I've always been like that in the geography of the city and my country, Mashhad, to be active in the field of art and culture and have little effect, however. With the motivation of its cooperation with the Hamdam Institute when I started, there was manna from heaven 400, and with them, the good organization of efficient management, law enforcement and physical hardware capable of causing to motivate and increase my inner energy and look and activity in the field of culture and art, I put at a wider level . Another interesting point was that considerate records of past and ongoing activities of the Hamdam Institute for discovered is trying to available capacities and potential . Presence of the publication, music group, art workshops, association with associated with great artists and people of culture and active participation in various events have brought prestige and honor for the institution to which the society has a remarkable position and appreciated the other hand, there is the potential that lies in the whole collection to creative thinking and management support to be able to see the effects of new activities. Before coming to the partner in charge of public and professional conferences Cultural Institute thought the third millennium, in collaboration with the cultural deputy of Imam Reza (AS) and calligraphers association executive director and now as I've worked Mashhad an expert on cultural affairs is a Hamdam to rehabilitation . Crossing the Cultural affairs Hamdam`s rehabilitation subset of public relations. As I said in response to questions, I always enjoyed art and cultural projects, and now that these activities have been in the service of the Hamdam Institute bakery and sweet it is to me a thousand times. What are the cultural benefits of a rehabilitation center? A lot of people still do not recognize this institution. Should see the city and the larger country and the international community at the center and the children become Hamdam`s familiar . One of the most effective ways of understanding cultural conferences and art from different walks of life are invited to participate in them. In addition, the Hamdam Institute to his daughters very much on the progress of educational, artistic and cultural significance asserts . The physical structure of the Institute for the gallery with an area of 400 m Conference hall with a capacity of 420 persons in accordance with the standards and principles as well as cultural horizon-wide view of management and the board of directors and board of trustees distinguished Cultural affairs led the field of public relations and special place to be. If our cultural tasks correctly and honestly do people become associated with the Institute for the "value" will then be brought into the faith and practice of benevolent people will be so connected to the Hamdam`s endless sea People's support will be more than ever . From the day he stepped on Hamdam of every moment of it and now I have the memories of many beautiful memories and I am able to write several books. Look full of questions and ambiguities children to the house of my mind is always engaged stamps and whys me to answer and hope for the children of this life I hope to double . Perhaps the best memory I have of being with children and outcomes of this is that my daughter last week that Thursday's eyes and with a passion and love for her Hamdam to come and visit friends and her love of the largest recreation deep relationship and honest with the child's emotional and Hamdam`s children can write and record memories . Again praised god for this beautiful every day and every moment to say thank you. The Hamdam`s good daughters need to be seen . That these girls also have the right to live and should be seen and loved . Tags for this class of mental retardation is not damaged. Hamdam`s girls loving , even at the lowest level and IQ kindly understand. Are nostalgic. Their hearts excuse themselves from loneliness and nostalgia . I wish to change the look and change the culture of the oppressed class, but powerful way to overcoming nostalgia meet with officials and lasting Hamdam can take appropriate steps. When you write beautiful love ,it does not matter if the pen is from the flower stalks or from the pigeon . Graphic expert I am a graduate student in visual communication and I have started my career since 1391 . Given the cyberspace is one of the best ways to advertise, designing and advertising for cybercafé is also for me . Working in a place like Hamdam institute that is the houses of 400 girls around the memories and the desire to be a problem for me, but I choose Since that example can clarify this, one of the memories that I forgot to tell On one of the autumn days of last year, Massoumeh Pasban came behind me in the room . I saw that Masoumeh was with a goal in the opening . Of course, with all the goals I ever scored was a gift I was different. M. floral gift, because she had made with leaves that are shed in the yard, and this was the best gift. There are many words I would like to say but in this occasion I would like to point out that being in love with my companion gives me a lot of positive feelings . I think this is the result of my dear mother's prayer that I have always been with me . When I was young, I think it is good for one adult in a job that would meet the spiritual needs of his material. Sometimes when I wish I was dismissed from the nursery to the day when I can serve my children. I grew up and graduated in computer science . I got into the job market and worked for some time in the Jihad Academy, and then I was the director of the Farabi Institute . So that the charities that maintenance and custody of children with disabilities and mental retardation were met and the gifts they have designed a site then invited me to work in their organization and later I met with the Hamdam Institute in 1393 and entered the collection as a person responsible for environmental advertising on the city level . Sense and relaxation Here I have not had previous workplace. Once I set everything else I forget when I work here . And where the name of the Hamdam taken pride I hold my head high and say I am working here. In my own part, I try to take steps to introduce the center and win support for these innocent girls . Usually we work so that out-of-office hours to serve Institute. Coordination of outdoor advertising and track design and implementation of advertising, including billboards and TV city, spaces for advertising agencies including the mayor, city train, bus and taxi and part of my duties. It is already advertising companies, municipalities and the charitable organizations that are next to perfect Hamdam`s girls have Thanks . I had a few months to leave for maternity leave and I went to the Institute's sweet memories these days . My most poignant memories of the death of the girls that I loved her was one of the girls in Saraye – Mehr. Usually in the morning I went to the isolation and handy that day when I went there I saw two girls cried and realized that Elahe is dead. And my best memory of Eyde – norooz that we invite children into our home and their colleagues also ate pizza we made room for them and it was very enjoyable. I like to work in Hamdam institute and thank the good managers of the center for the family that they have made . 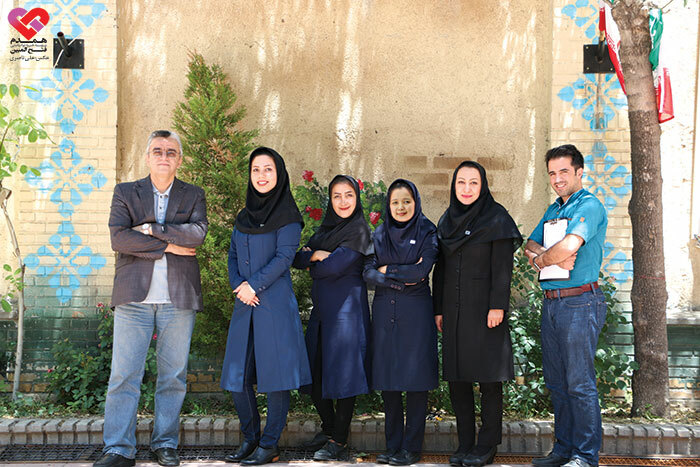 Mr. Shirazi Nia and Mrs. Dr . Hojjat like mother and father that they are for children behave and this is very valuable. I love my good colleague always work very much, especially my housband worked in the field of Hamdam`s working with me and has never left me alone. Computer experts tend hardware. Before 3 years as a public relations representative for ISO and I work with a Hamdam institute of 1393 was introduced through a friend I started working. My first to me was hard and stressful . I was not sure that I could control my feelings against these guys and do not deal with sense of pity . After some times, I worked in Public Relations Department . I work in Hamdam`s public relations continued to Winter 93, and then according to the needs of presence in virtual environments and activities on the website as site admin and Hamdam`s virtual spaces to keep my companion. Activities in this section do not have time and place and should always be online and available everywhere . In the moment In addition to its Hamdam`s website is independent and totally updated and completed, on social networks such as Facebook, Google+, Instagram, Telegram, ….. has a membership and fortunately has been welcomed very well . Given the tendency of people to the social networks, the impact of information and advertising charity events very salient of these networks and have very good results in the introduction and participation. The activity of this division is two-way . On the one hand, information and reflection workshop activities for girls' education, public relations and good things within the various sectors and institutions responsible for the collection and informing the other hand, Timely and proper presentation of attracting force participation and helpers and the various parts can help. Today, after two years of active presence in social networks such as Instagram and Hamdam`s channel telegram companion, companion not only in the city of Mashhad known, but in many provinces. For example, share clips of the band performing the song with an artist's companion that clip by artist and shared by the fans and that's what makes the acquaintance of a large number of users on the network with a Hamdam. The share many times by artists and intellectuals have been repeated and very fruitful. Usually next to the virtual network updates and Hamdam`s website and the aforementioned activities, to hold various events such as markets and trade partners in the public relations part of the tasks entrusted am . Here's memory maker moment and see the joys and sorrows claiming the lives of children in different situations affects. I am not a mother yet but I often feel that the little girls mother hugging shelter house real emotions I have experienced. No time to look at it as a job yet and I've always enjoyed. I do not work next to the Hamdam`s girls , I live. Here I feel clean these guys to feel your heart forever stuck in jams. Urban planning graduate of the University of Ferdowsi Mashhad am in college, editor and owner of scholarly publications - a student, a founding board member association for poem and litrature Ferdowsi University, host of the program, a student activist in cultural units Jahad - Daneshgahi from 1378 to 1381 and then after the university experienced reporter of the Shahr – ara newspaper , public relations director in Elmi – Karbordi University in Khorasan Razavi and expert have been. In 1394 I became member of the Public Relations Department . I am a government guide and various news conferences, meetings, visits and meetings, and the Hamdam to write. Also colleagues with donors and private and public institutions for events and celebrations negotiate with public relations and social media and in the relationship. Coordination and cooperation in the camps is also part of my activities. Hamdam is, at any moment, a memory and work here is not a repeat . God has graciously allowed me time for my soul Hamdam`s angels. The human`s life It is full of blessings. The best memory is that some of the Hamdam`s girls who are the same age as my dad would say to me !! In the words of all the employees of the Institute of Public Relations Partners, they are effective in their pursuit of their goals and behaviors . Relations between the public and the activities ongoing at the Institute would always had good and blessed. We hope that this unit with a focus on the aspects of what it has always done a program of charity is successful and the window of his always clear .